Comments/Context: I recently came across this thin catalog from a Laurie Simmons gallery exhibition that I missed a few years ago. 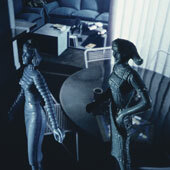 The book documents one of her earlier, lesser known projects, where plastic dolls (from Japan, known as the “Teenettes“) have been placed in front of various interiors scenes, which have been projected from behind. In each staged setting, the color of the dolls matches the colors of the room with a level of perfection that is altogether unnerving. In general, while Simmons’ more recent images of houses, cakes, cameras and guns walking on doll legs might be more familiar to many collectors, I think these earlier works deserve attention as well, especially for their sly reflections on an impossibly controlled life that is both a paradise and a prison.